Teach Your Kids to Think: Simple Tools You Can Use Every Day is designed to help parents teach their children how to think wisely and well during the time they already spend together. 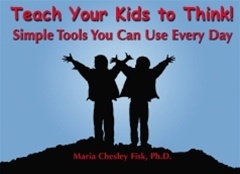 Using the latest research, author Maria Chesley Fisk, Ph.D., has created a series of easy-to-use, fun tools that can be used whenever parents are with their 4- to 12-year-old children. The tools are divided into four sections that represent different kinds of thinking: analytical, creative, social; emotional, and practical. "The main criterion by which a child's learning will be judged in this century is not how much information has been memorized, but how well he or she can apply thinking skills to the challenges they face in their work and daily lives. This book is a basic primer for developing these skills and should be in every home and classroom where people care about the future of learning." "Teach Your Kids to Think! translates current research in a way that parents can understand and immediately use. Neuroscience indicates that we have multiple intelligences—this book gives parents tools that transform this understanding into actionable nuggets." "This book addresses the critical need to educate the whole child that is too often lost in education today. I wholeheartedly recommend it to parents, professional educators, and anyone who is interested in practical ideas about how to expand children's abilities to function intellectually, socially, and emotionally in today's world." "Teach Your Kids to Think! is a great resource for parents and teachers who want to teach the thinking skills so necessary in the 21st century, but aren't sure what they are and how to teach them. As an added benefit, adults who teach thinking skills to children hone their own thinking skills, giving them the tools to survive and thrive in our increasingly complex world!" "In order to learn to think effectively, I believe that children need two teaching tools. One tool is loving parents who want to see their children become proficient in thinking because they know how important it is. The other teaching tool includes nothing more than purposeful, valid and easy-to-use teaching kits. These kits must also be joyful to use and show results. Teach Your Kids to Think! is the kind of tool I described above. It is presented in a simple and tasteful way. Based on what we know about school principals’ observations regarding parental involvement in education, I dare to predict that the use of Dr. Fisk’s guidelines published in this book will bring excellent results." "With all the parenting books available and no time to read them, Teach Your Kids to Think! gives me the chance to incorporate fresh and stimulating moments in our everyday activities. What makes this toolkit so valuable is that it doesn't ask us to spend time learning it. It's simply and clearly laid out, and the ideas can be incorporated into what we are already doing." "This is a must-have book for any parent who wants to give their children important skills that will help them think for themselves – skills that will pave the way to successfully meet the challenges they will face throughout their lives." "This book is a valuable tool for bridging the work of parents and professional educators. It can serve as a common point of reference for parents and teachers as they think about positive strategies and interventions for children." Dr. Maria Chesley Fisk is a translator of educational and psychological research for parents. She provides materials and parent workshop opportunities for reflection, learning, and support. Maria earned her Ph.D. in educational studies at the University of Michigan. She has directed a teacher training program, provided professional development for teachers and administrators, served as a consultant to schools and school districts, and contributed to a project about digital games.